These 3 Stocks Are Up More Than 40% in a Year; Are They Still a Good Value? 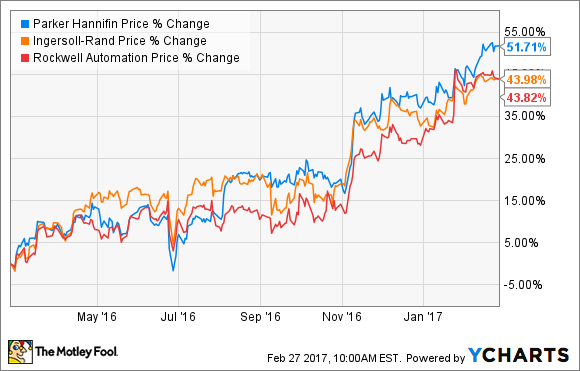 It's been a great year for investors in Rockwell Automation, Ingersoll-Rand, and Parker-Hannifin, and all three stocks could also do well in 2017. Rockwell Automation (NYSE:ROK), Ingersoll-Rand PLC (NYSE:IR), and Parker-Hannifin Corp. (NYSE:PH) are three industrial companies that have seen their stock prices go up by more than 40% in the last year. Can these stocks maintain an upwards momentum this year? Let's take a brief look at prospects for all three now that earnings reports for the first calendar quarter of 2017 are all in. All three are industrial companies that will benefit from a general climate of improving industrial conditions in 2017, but they have different near- and long-term earnings drivers. Rockwell Automation will benefit in 2017 from a cyclical improvement in capital spending conditions -- particularly in the oil and gas markets -- and its software, sensors, and controls have a long-term opportunity from Industrial Internet of Things spending. Ingersoll-Rand's core heating, ventilation and air-conditioning (HVAC) operations (Trane) are set for a solid 2017, and the company has a long-term opportunity to expand operating margin while continuing an excellent record of cash flow generation. Parker-Hannifin's motion and control technology solutions give it strong exposure to a recovering industrial economy in 2017, and management has aggressive long-term margin-expansion targets in place. All three are attractive stocks, and a look at their recent results confirms good earnings momentum in 2017. The following table outlines current headline guidance (given in each company's recent earnings presentation) compared to the last available guidance. As you can see below, Rockwell Automation and Parker-Hannifin both hiked 2017 organic sales and EPS (earnings per share) outlooks in the quarter. Meanwhile, Ingersoll-Rand actually missed its fourth-quarter 2016 guidance, but this was due to discrete items (corporate costs and tax). However, its outlook for margin expansion and revenue growth in 2017 was warmly received by the market. Data source: Company presentations. *Rockwell Automation's fiscal year ends in September. **Second half growth; Parker-Hannifin's fiscal year ends in June. ***Continuing operations. The headline numbers look good -- and better than previous expectations -- and there are signs that each company's underlying earnings drivers are improving too. For 2017, Rockwell's management expects its heavy-industry end markets to be "flat year over year" with "continued growth" in consumer and transportation end markets. Considering that Rockwell's solutions tend to be tied to capital spending (which tends to flow later in a recovery), the heavy-industry outlook is a positive. Moreover, on the earnings call, then-CFO Ted Crandall outlined how the "better than expected organic growth in Q1 accounts for most of the increase [in] the organic growth guidance for the full year, though our outlook for sales for the balance of the year remains reasonably constant with our November guidance." In other words, there is room for upside to guidance if the economy continues to improve in 2017. Ingersoll-Rand's climate segment (78% of 2016 revenue) ended 2016 on a very strong note with 10% growth in organic bookings, and management expects HVAC (commercial and residential) revenues to grow by mid-single digits in 2017, leading to a forecast for organic segment revenue to grow 4% in 2017. Meanwhile, management expects overall adjusted operating margin to improve to 12.6%, from 12.2% in 2016. A quick look at a breakout of Parker-Hannifin's organic order growth confirms the positive trends in its end markets, with COO Lee Banks saying on the earnings call that "many of our markets are showing positive momentum toward year-over-year growth as I go around the world." Moreover, management restructuring activities are expected to produce ongoing margin expansion and excellent cash flow generation. Are they still a good value? 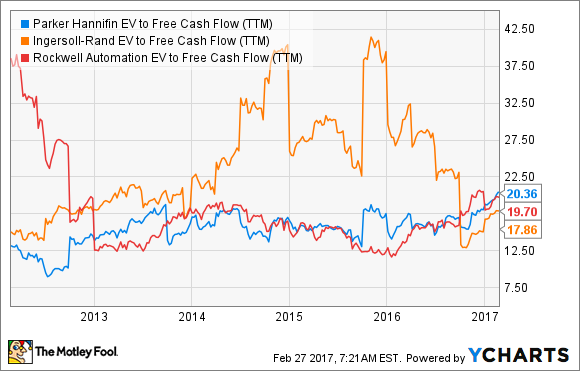 As you can see below, all three are attractive on a basis of enterprise value (market cap plus net debt) to free cash flow. In plain English, a ratio of 20 means a company is currently generating 5% of its value in free cash flow -- if you owned the whole business you could pull out 5% a year, and the business would still be growing. Moreover, they all have good growth prospects in 2017, with some possibility of upside to earnings guidance, and good long-term prospects, provided industrial and energy markets continue their positive trends.